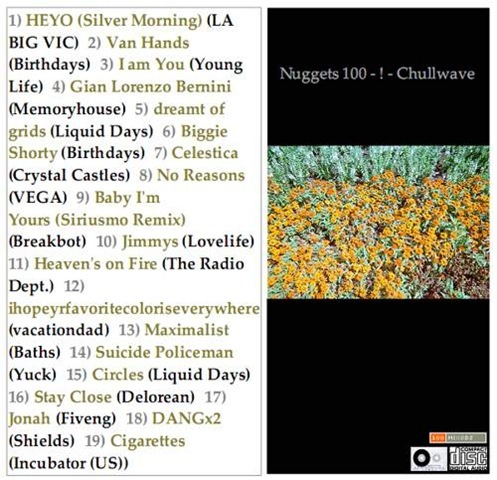 Last time I approached a mixtape anniversary (the 100th), I decided to make a series of mixes with different themes highlighting what I had come to love over the previous 99. This is mix remains one of my favourites, the first 7 tracks in particular; dreamy voices lost in the mix. I liken them to electronic versions of Phil Spector’s Wall of Sound. Why chullwave? Well, at the time I made this mix the music wags had yet to decide on a name for the keyboardy electronic sound with processed voices that was becoming popular. Chillwave, or better chullwave as one Scottish blogger termed it, is / was a term bandied about for this sound.